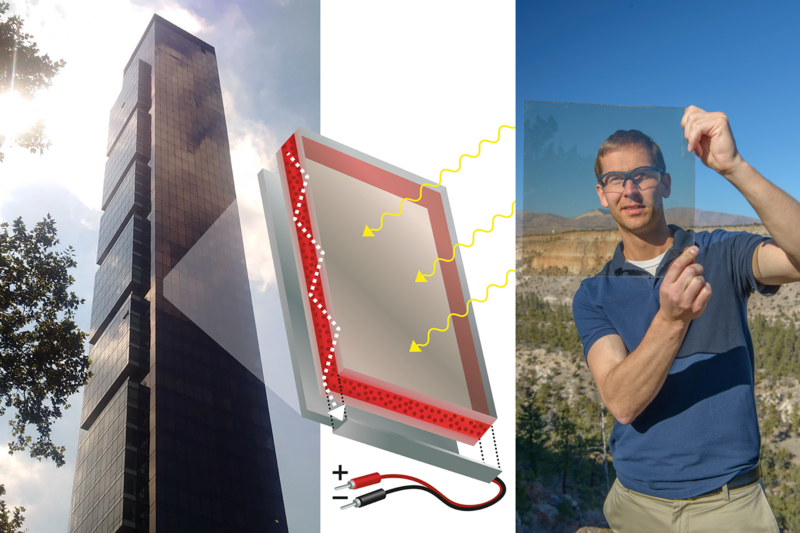 Building-integrated sunlight harvesting utilizing laminated glass luminescent solar concentrators (LSCs) is proposed. By incorporating high quantum yield (>90%), NIR-emitting CuInS2/ZnS quantum dots into the polymer interlayer between two sheets of low-iron float glass, a record optical efficiency of 8.1% is demonstrated for a 10 cm × 10 cm device that transmits ∼44% visible light. After completing prototypes by attaching silicon solar cells along the perimeter of the device, the electrical power conversion efficiency was certified at 2.2% with a black background and at 2.9% using a reflective substrate. This “drop-in” LSC solution is particularly attractive because it fits within the existing glazing industry value chain with only modest changes to typical glazing products. Performance modeling predicts >1 GWh annual electricity production for a typical urban skyscraper in most major U.S. cities, enabling significant energy cost savings and potentially “net-zero” buildings. Read the article here. Find the full article and supporting information here.